What are the reporting obligations in the European energy acquis? The purpose of this study was to map and analyse the distribution of the reporting obligation in the EU energy acquis. In the current EU energy acquis, planning and reporting obligations have been designed for each EU energy policy. They include numerous planning and reporting obligations, and have some inconsistencies and inefficiencies. This study has analysed 57 reporting and 15 planning obligations, as well as 6 evaluations and 11 statistical obligations, covered by 31 pieces of legislation. 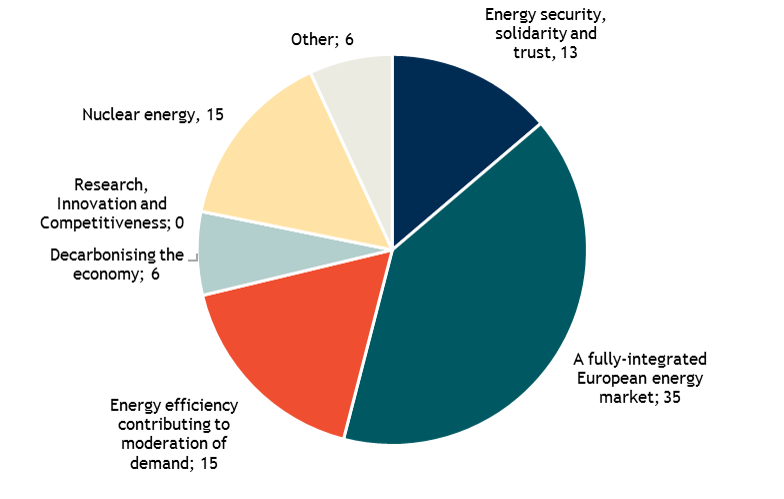 Most obligations are related to a fully-integrated European energy market (35), followed by energy efficiency (15) and nuclear energy (15), energy security, solidarity and trust (13) and decarbonising the economy (6). Six obligations were categorised as ‘Other’. Some obligations, most notably obligations on nuclear energy, do not obviously fit under any of the Energy Union dimensions. Key findings: The division of the obligation by Energy Union topic. Source: Final Report. According to the survey results, the most burdensome reporting requirements appears to be those related to the energy efficiency legislation, in particular the Energy Efficiency Directive, where substantial subcontracting and outsourcing costs were identified to prepare the National Energy Efficiency Action Plans (up to 50,000 euro per year). The quantitative analysis identified 28 reporting indicators in five legislations that overlap with indicators in the Eurostat database. Another 3 indicators overlap partially. More than half of the obligations show a link with the transport field and/or the climate field. The study relied heavily on qualitative data as quantitative data was not always possible to collect. It identified specific situations in which improvements could be made. Interviews with DG Energy officials confirmed that Members States’ reporting generally provides the Commission with information that is not available from other sources and allows the Commission to monitor implementation. However, it was also recognised that there is scope for removing some redundant and overlapping requirements. There were mixed views amongst Member States on the contribution of reporting to the alignment of national approaches and to improving coherence within Member States. There appears to be a high level of belief in the contribution of reporting to improving the transparency of energy policy across Member States, but much less confidence in the ability of reporting to improve transparency on energy expenditure. Trinomics led the study, which was excecuted mainly in the first half of 2016 in collaboration with Technopolis Group and Ludwig Bölkow Systemtechnik (LBST). The European Commission published the final report as of 18 July on their website here.